As the final in a series of three collections of insights from some great Canadian urbanism, I’m tempted to pull out images from other Canadian cities, and see what they have to say. But don’t worry, I’ll let my fellow PlaceShakers have the Monday spots for awhile. Your insights welcome in the comments below, or if you missed them, on the Montreal and Mont-Tremblant segments. 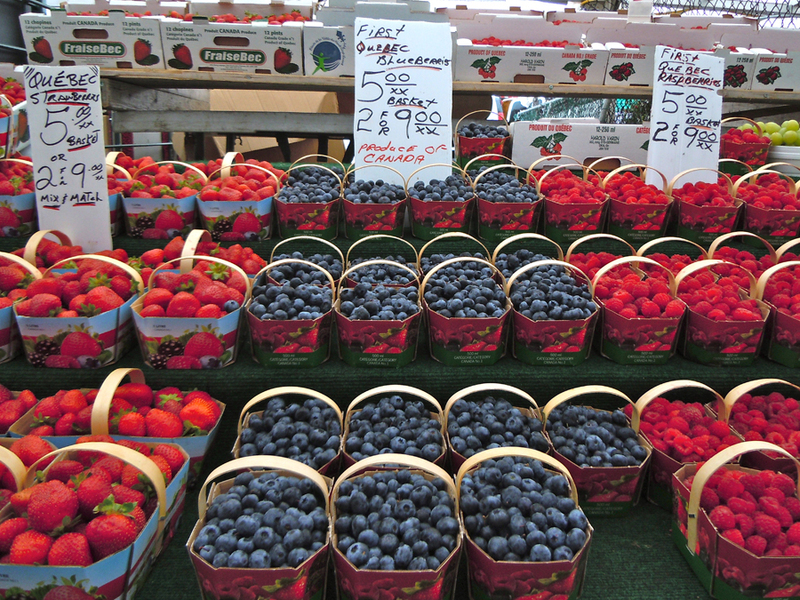 One of Canada’s oldest and largest public markets, the Byward Market is a short walk from Parliament Hill and the heart of Ottawa. 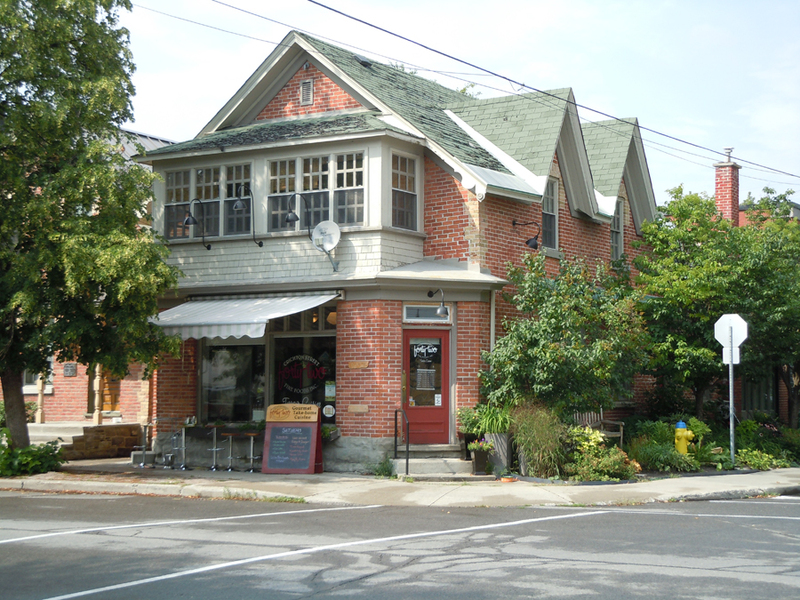 Planned by the builder of the Rideau Canal, Colonel John By, the market anchors a great neighbourhood. 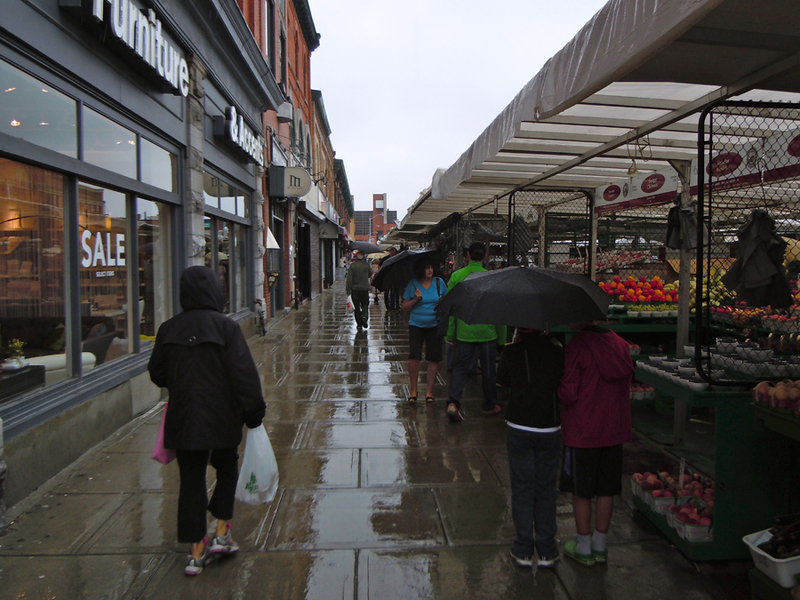 At the Byward Market, farm stands snuggle up to store fronts, making even rainy days feel cozy. 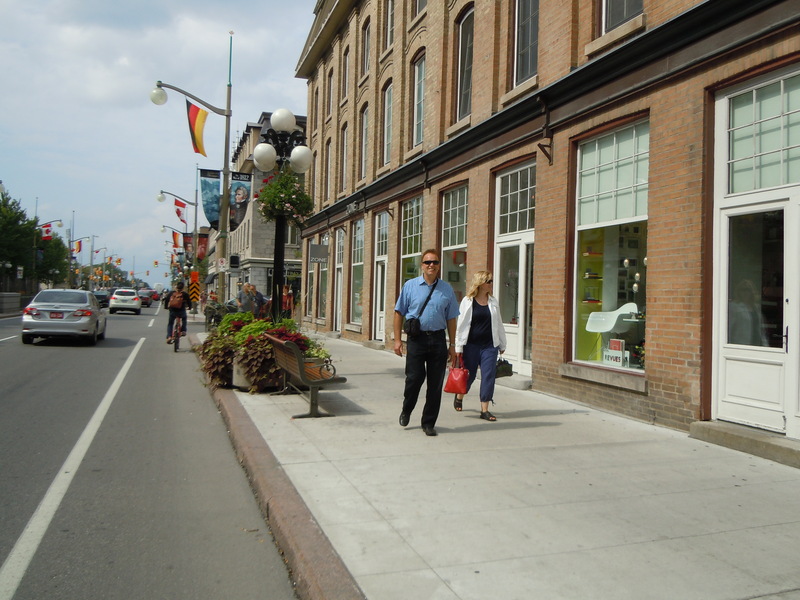 Colonel By laid out George and York Streets extra wide for public market space. 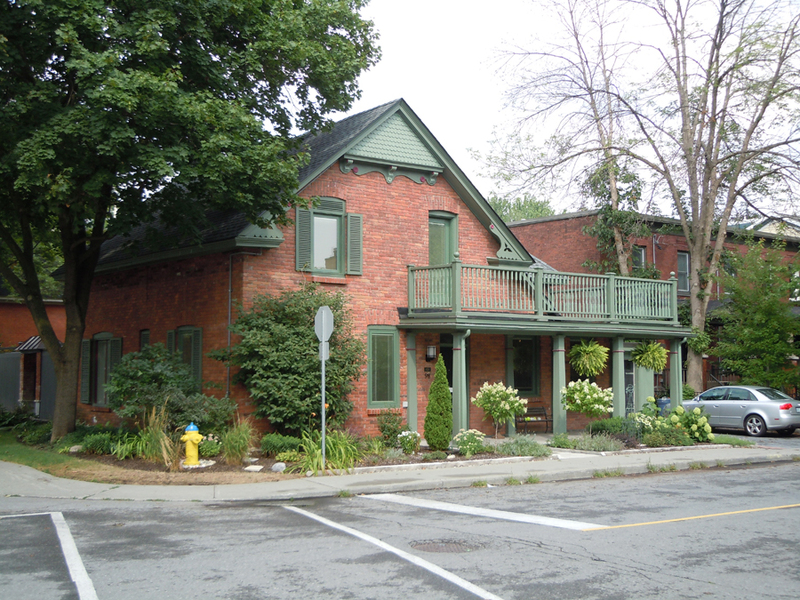 Vertical mixed use quickly changes into single-family detached, with the four blocks square Byward Market as the heart of the neighbourhood. The Rideau Canal connects Ottawa and Kingston with 202 kilometers of navigable waterway, and is a spectacular UNESCO World Heritage Site. As the oldest operating canal in North America, it was originally designed as a defense route against the US. 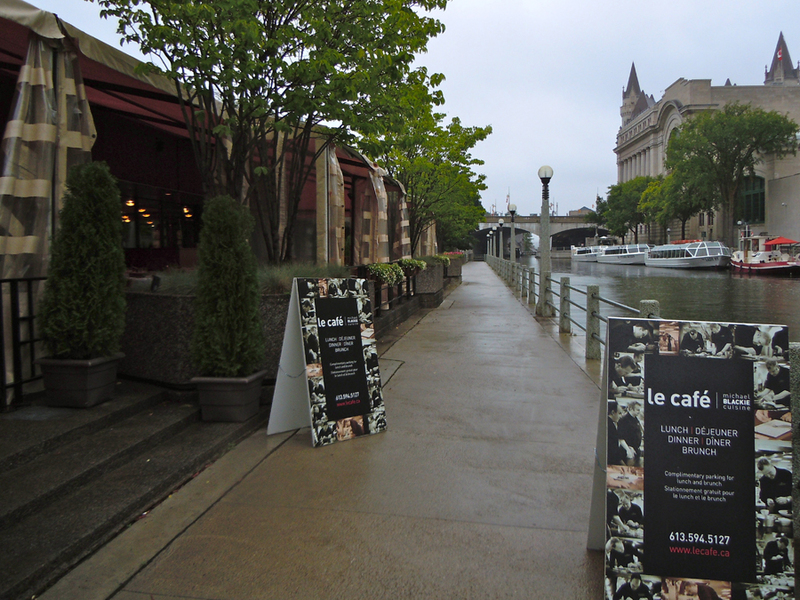 The biggest urban design lessons from both the Rideau Canal and Ottawa River aren’t defensive, though. Instead, they demonstrate the great value of keeping waterways as public property in the city center, providing a stellar parks and trails system that hosts active transportation and entertainment year round. 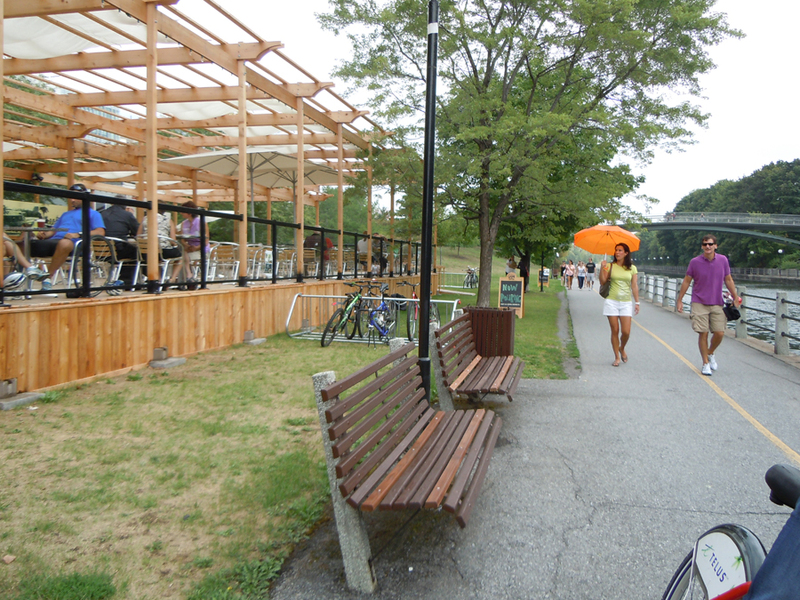 Other places seeking to enable similar public space will find inspiration in the form-based development bylaw of Dan Bartman’s Canal Urbanism SmartCode Module (3 mb PDF). 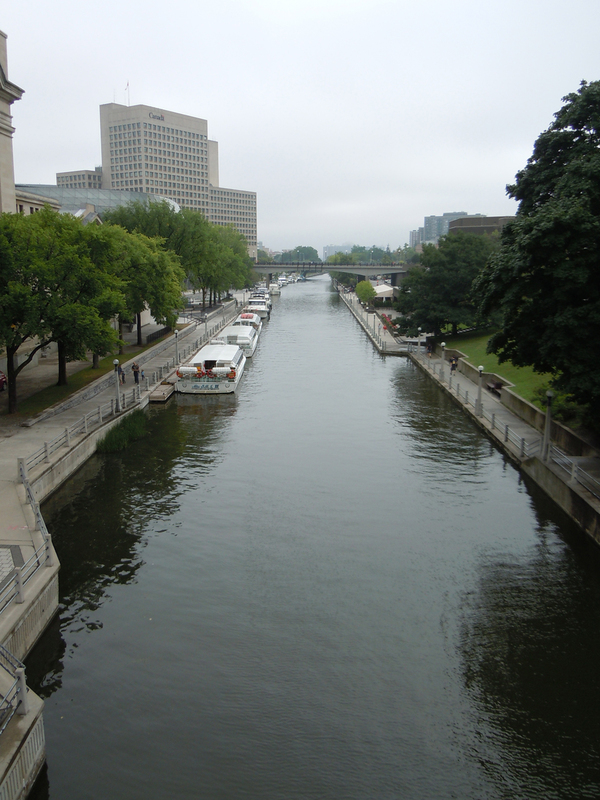 Rideau Canal has predominately public shores. 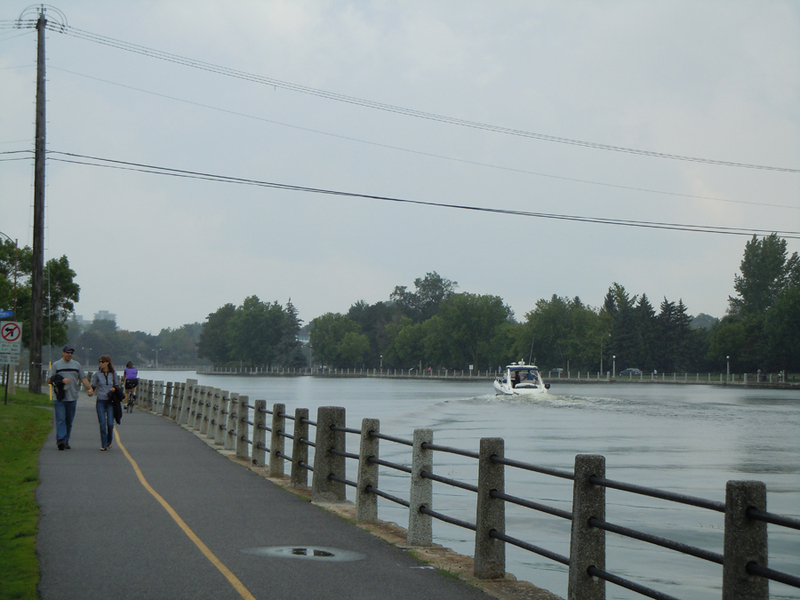 Great paths border the 202 kilometer Rideau Canal. The route from downtown to the airport is mostly along the canal, making a stately entry. A place to walk, a place to cycle, a place to sit, a place to drink. A path, a bench, some shade, and a berth make this an exceptionally satisfying public space. 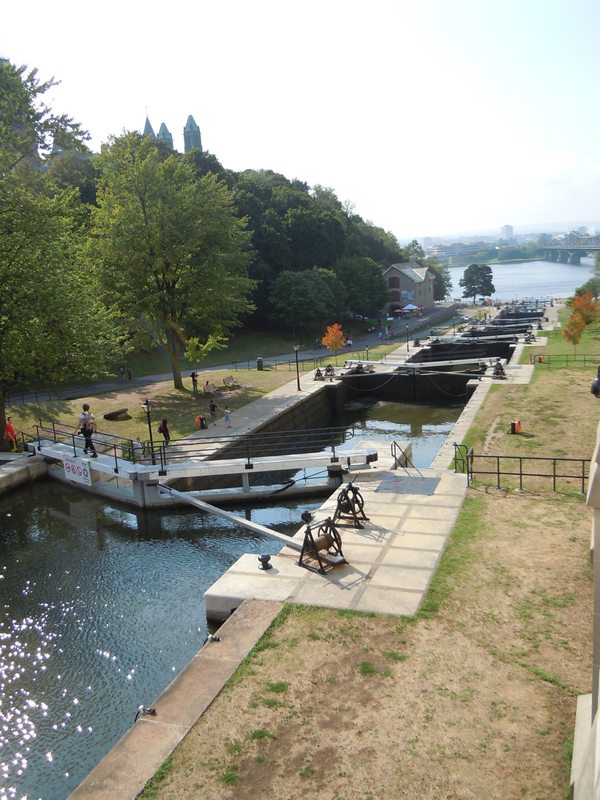 The Ottawa Locks on the Rideau Canal make way for boats May through October. In the winter, Ottawa (7.8 km) rivals Winnipeg (8.5 km) for the longest skating rink in the world. 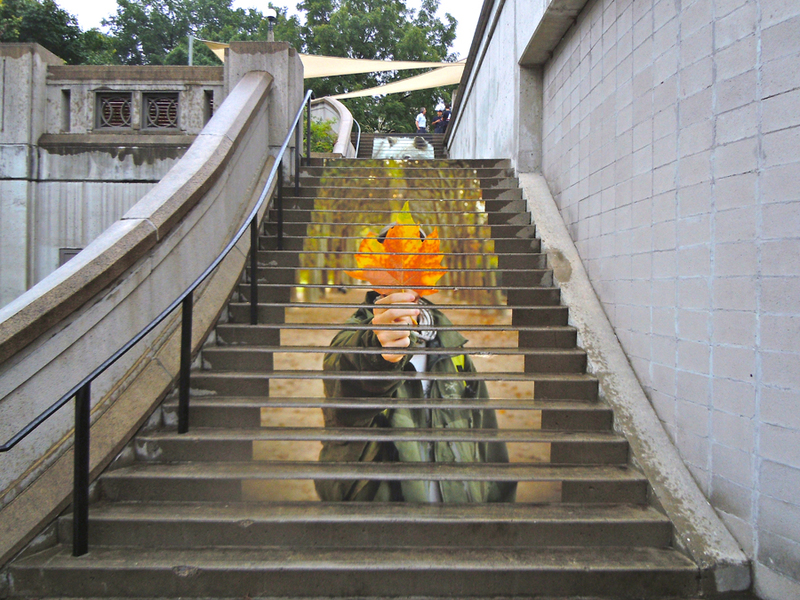 The prodigious National Gallery of Canada significantly elevates public art, both on its grounds and throughout the city. 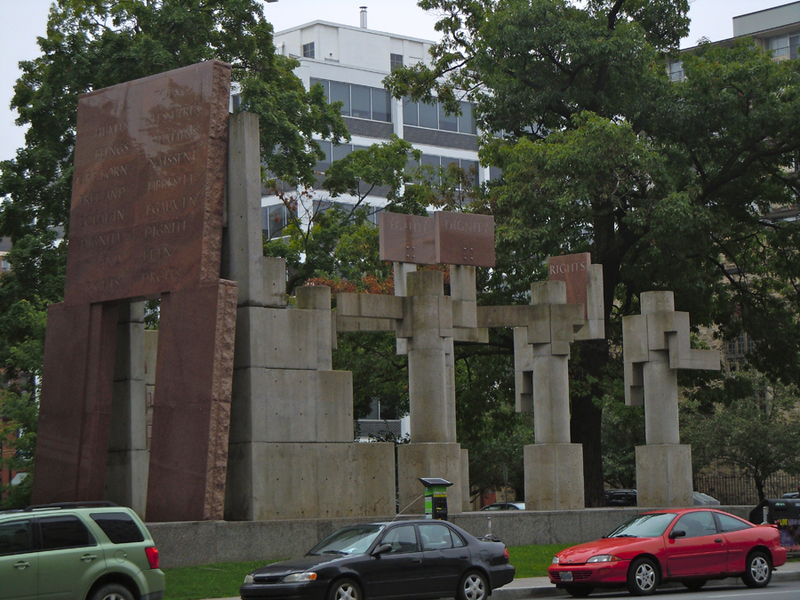 The National Capital Commission furthers the dialogue with StreetSmART and Decoding Art aps. 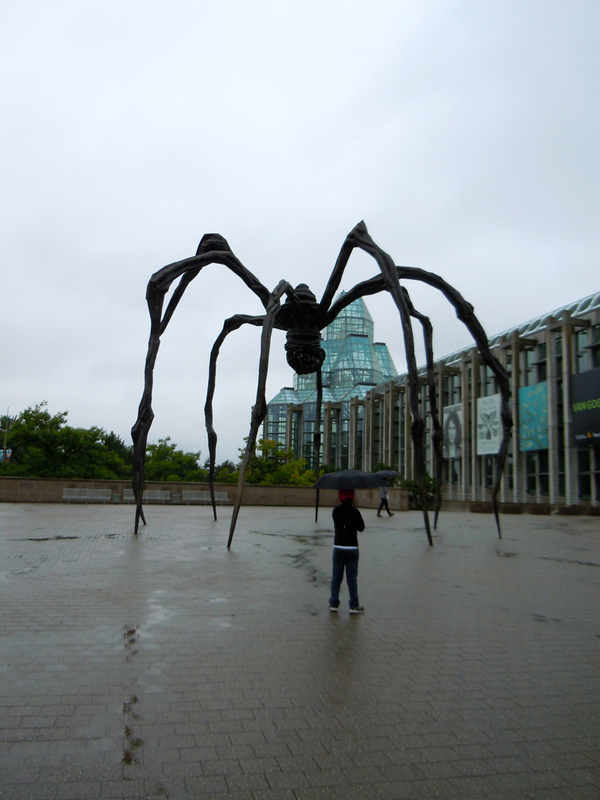 Maman by Louise Bourgeois, 1999, watches over the National Gallery of Canada entrance. Name this artist? I can’t. 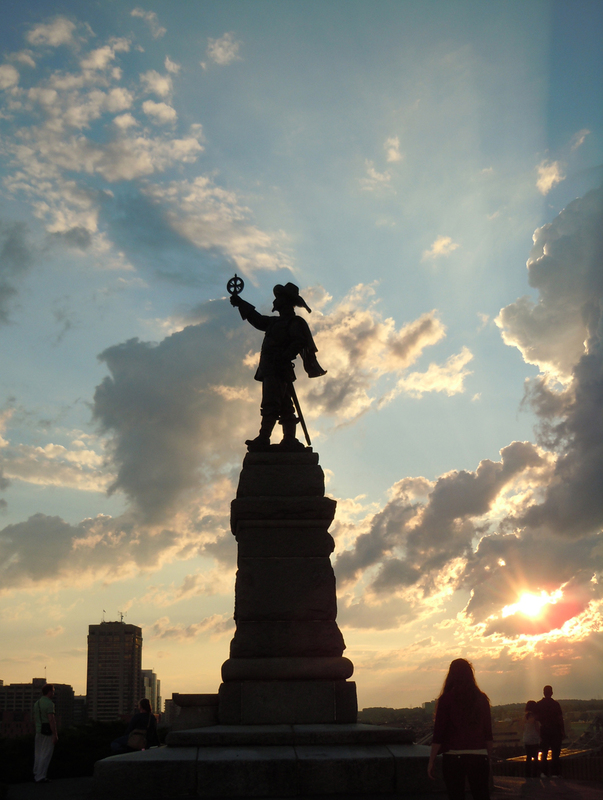 Samuel de Champlain sculpted by Hamilton MacCarthy in 1915, thanks to the National Capital Commission. One Hundred Foot Line by Roxy Paine overlooks the National Gallery of Canada’s curatorial wing. 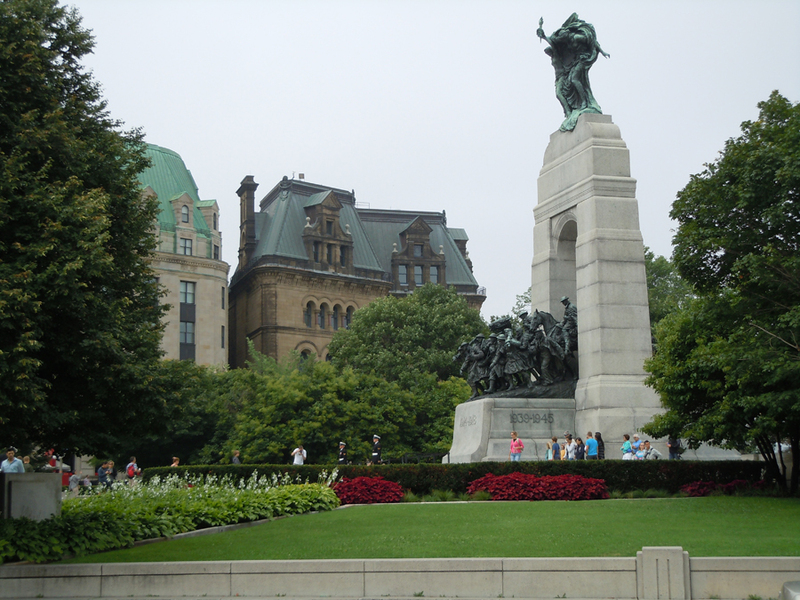 The National War Memorial by Vernon March highlights its surrounding urbanism. 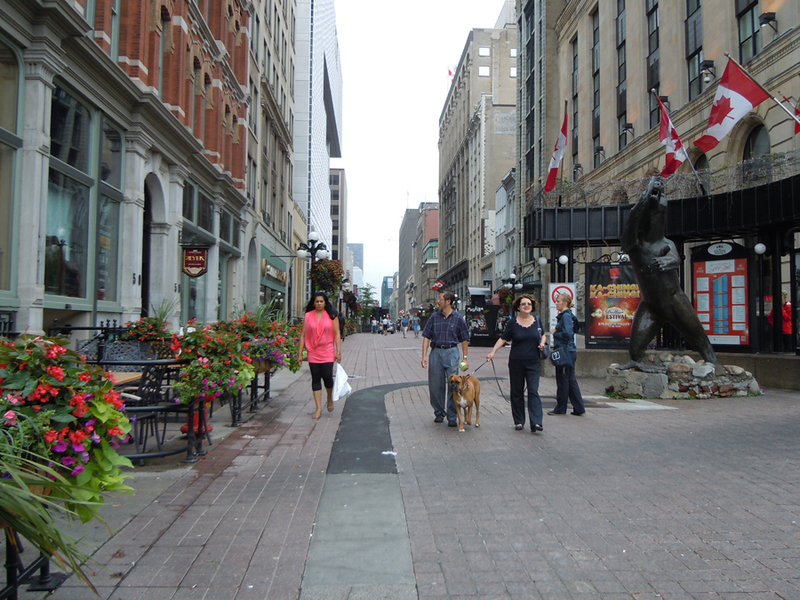 No amount of public art will help the Sparks Street pedestrian mall until it gets mixed-use right. We talk a lot on PlaceShakers about extracting the DNA of place and allowing it by right because much of what makes up the urban fabric of great places isn’t legal anymore. 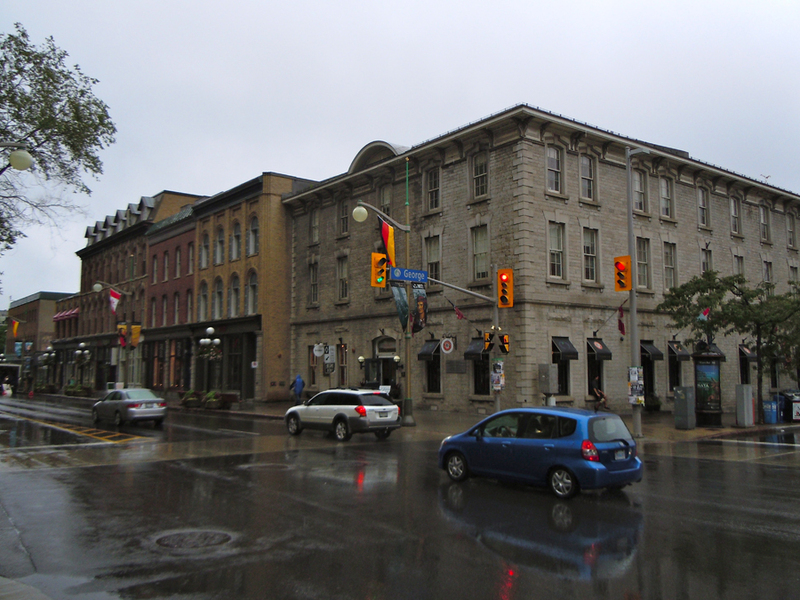 Here in Ottawa, much of that is the vertical mixed use, build-to-lines instead of suburban setbacks, streets that have gone on diets to make room for on-street parking and cyclists, and careful thought to how the buildings meet the street. Civic spaces take up centre stage with gracious architecture and ample urbanism. Canadian Museum of Nature with a particularly thoughtful renovation. Definitely worth a visit. 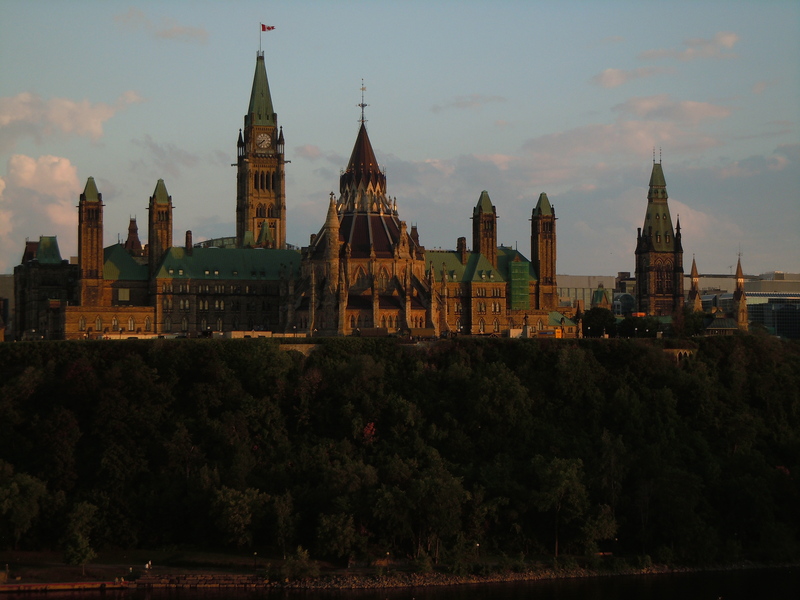 Parliament offices and downtown, overlooking Ottawa River. 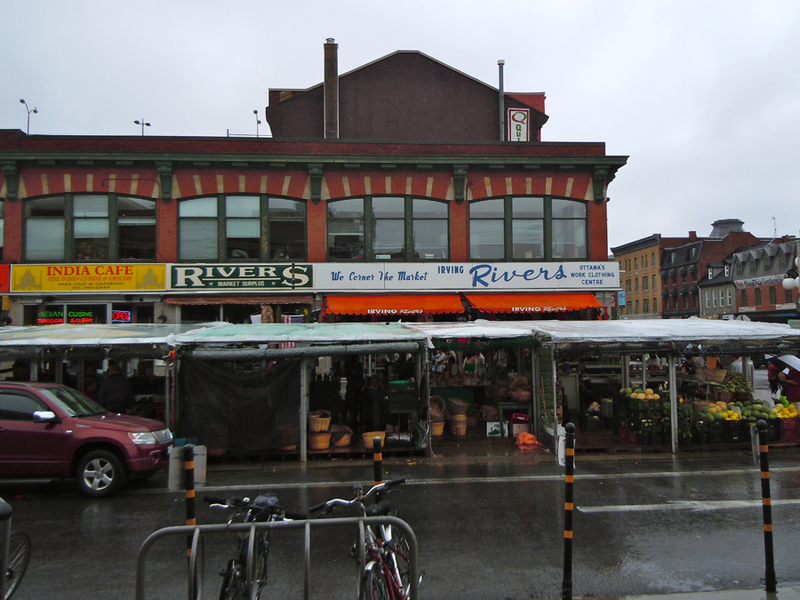 Beginning of Byward Market showing off vertical mixed use and a solid street wall. Doesn’t look like a mall, but it is. 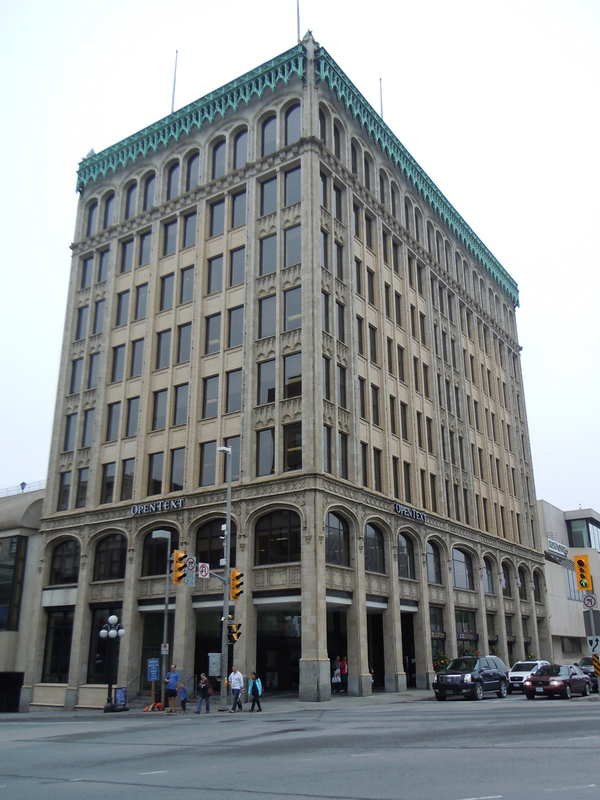 On Rideau Street at Sussex Drive. 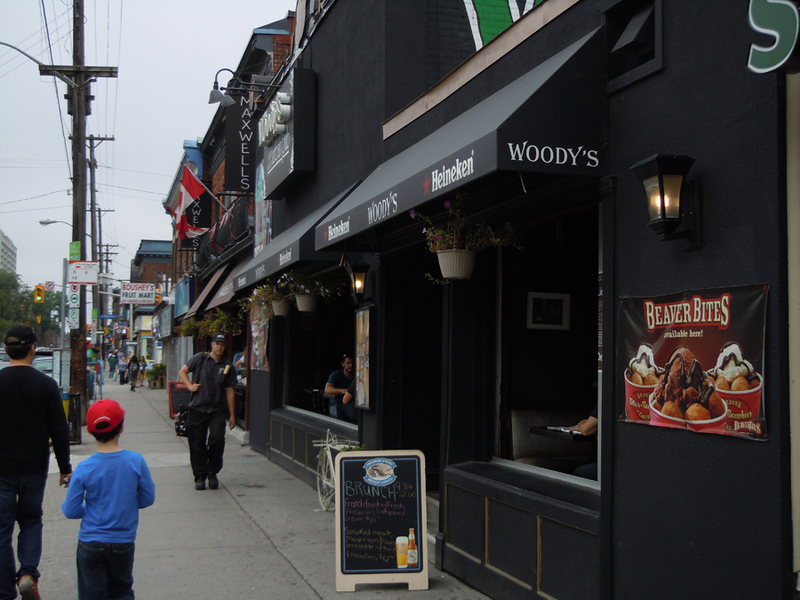 Centretown restaurants park on the street or out back, and many guests arrive on foot. 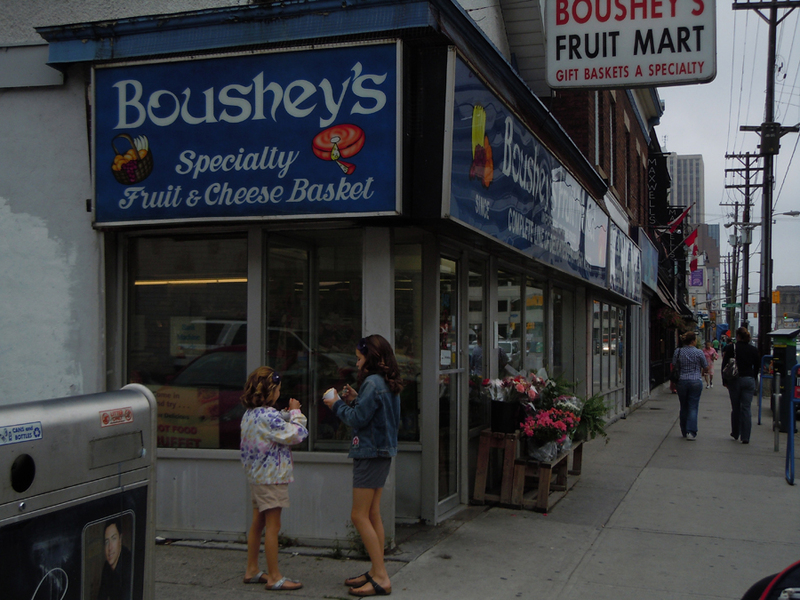 Centretown corner stores are plentiful. 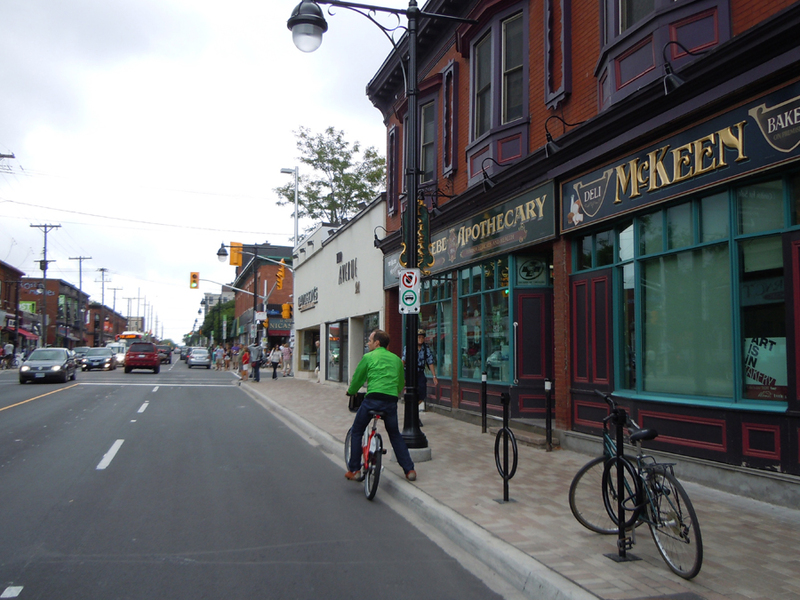 The Glebe shows a great shopping street must start with a great street. 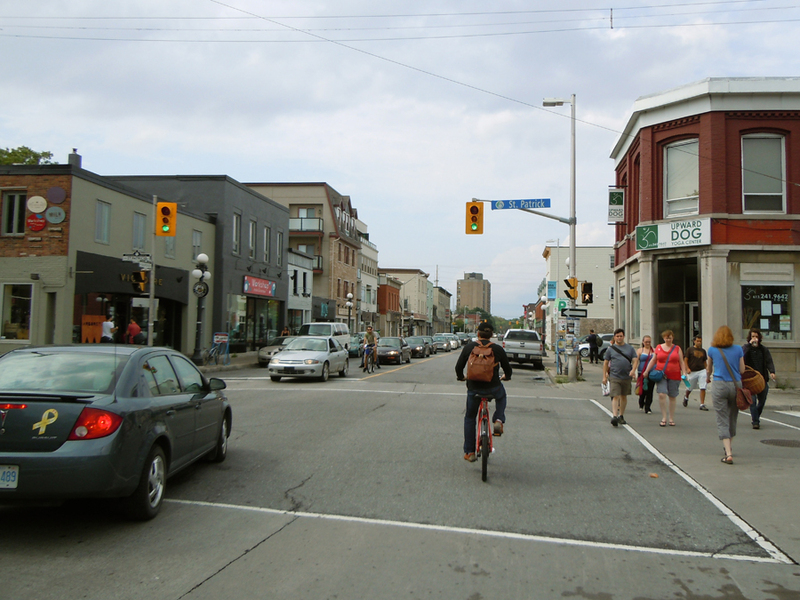 Cars are slow enough for cyclists and pedestrians to mix in easily. 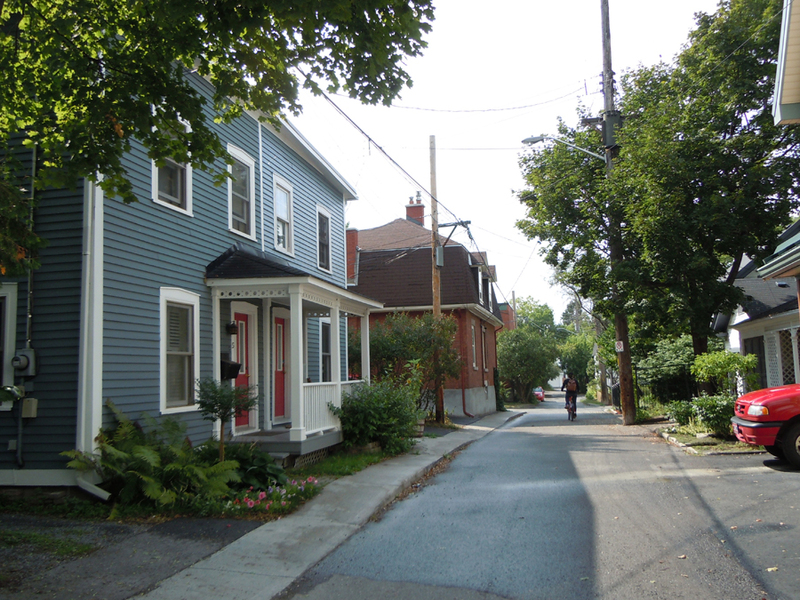 The Glebe neighbourhood mixes traditional and modern architecture and makes it work by keeping the setbacks and massing constant. Lowertown gets it right on setbacks, mixed-use, lane widths. 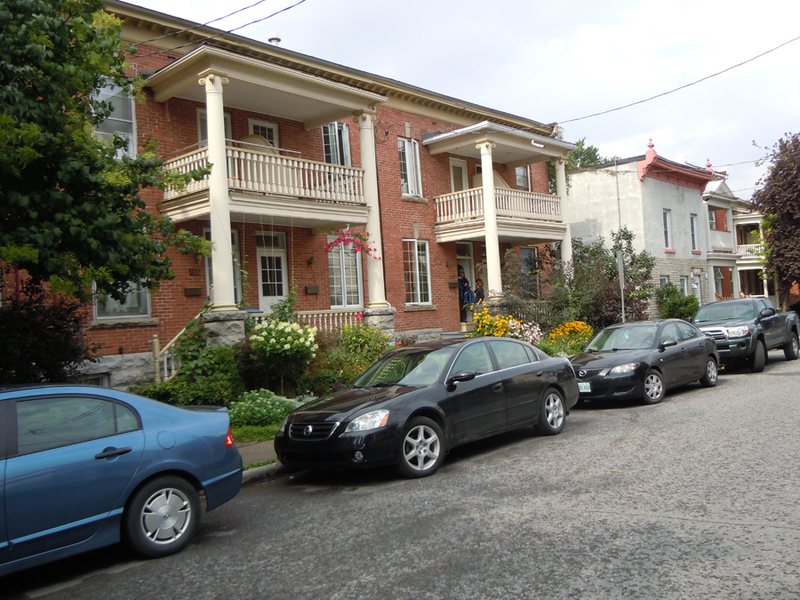 An occasional surface parking lot is a Transect violation. 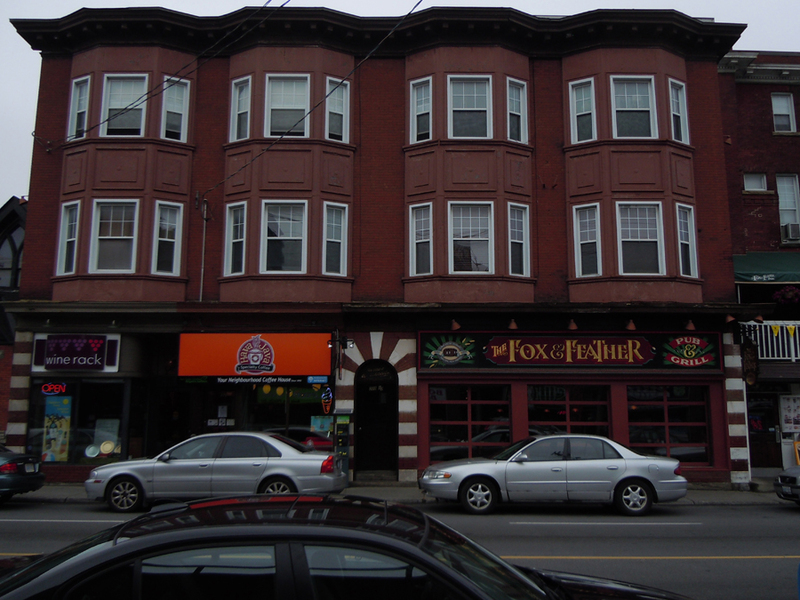 Great corner store in New Edinburgh surrounded by single family homes and duplexes. 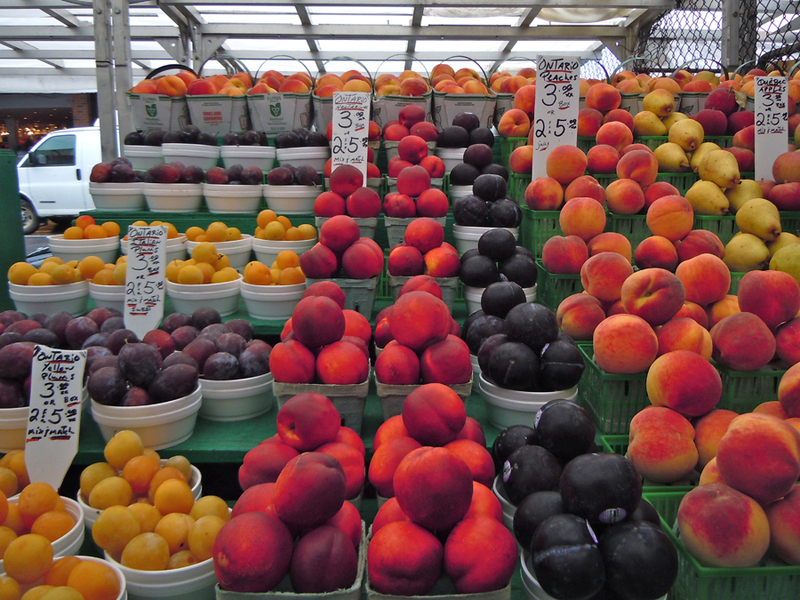 Byward Market isn’t all market. It is, however, all good! Ottawa’s urban fabric is punctuated by all sorts of pageantry, including the Changing of the Guard marching down the ceremonial route through the cityevery summer morning! Bands play daily in summertime on Parliament Hill in front of the Peace Tower. Last Monday we discussed Canadians and their affinity for the simple pleasures of cottage living. 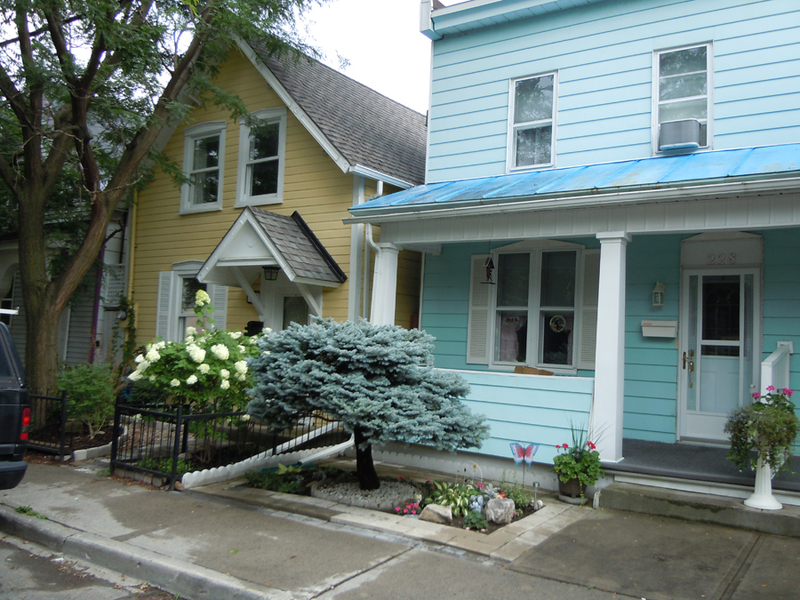 Ottawa has a great collection of cottages offering a more affordable option to smaller households. 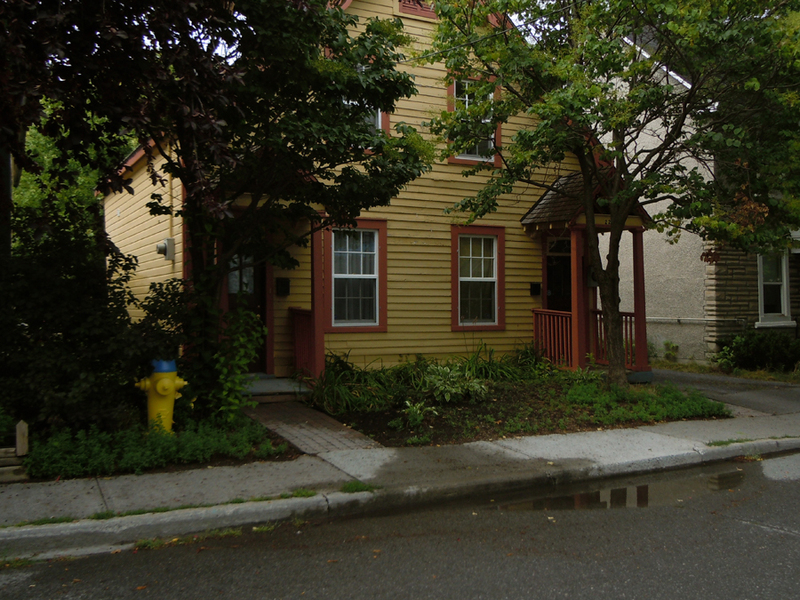 This Lowertown cottage becomes a little more affordable as a duplex. 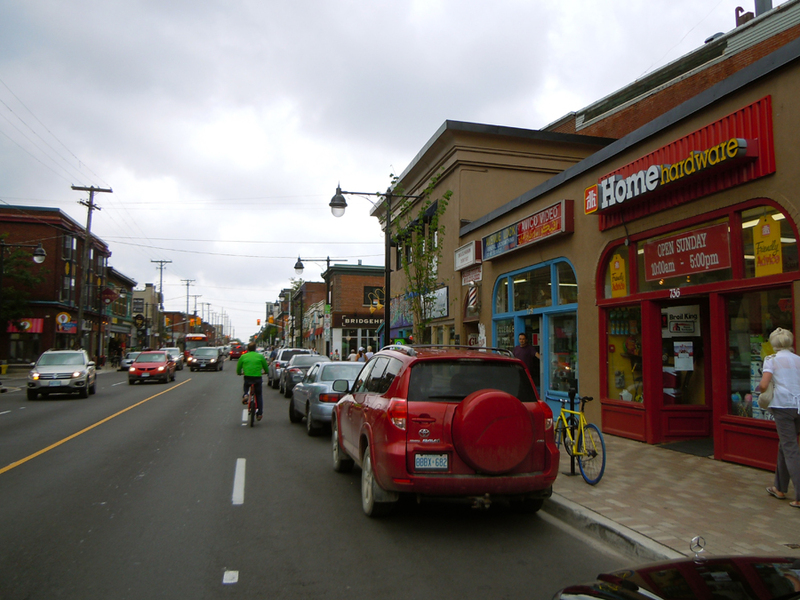 Capital cities aren’t particularly known for their affordability, particularly in neighbourhoods easily walkable to downtown. 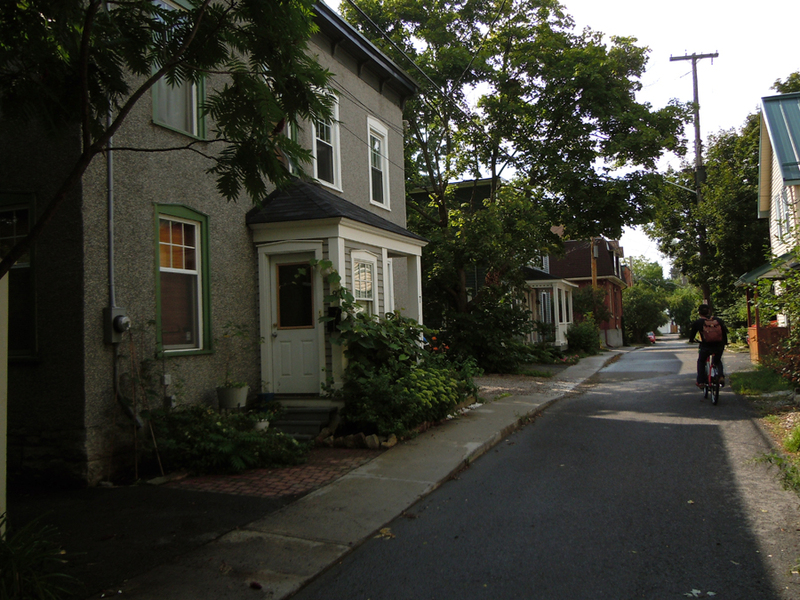 Ottawa’s answer to that is an exemplary collection of duplexes and mews units along what you might otherwise think of as rear lanes. 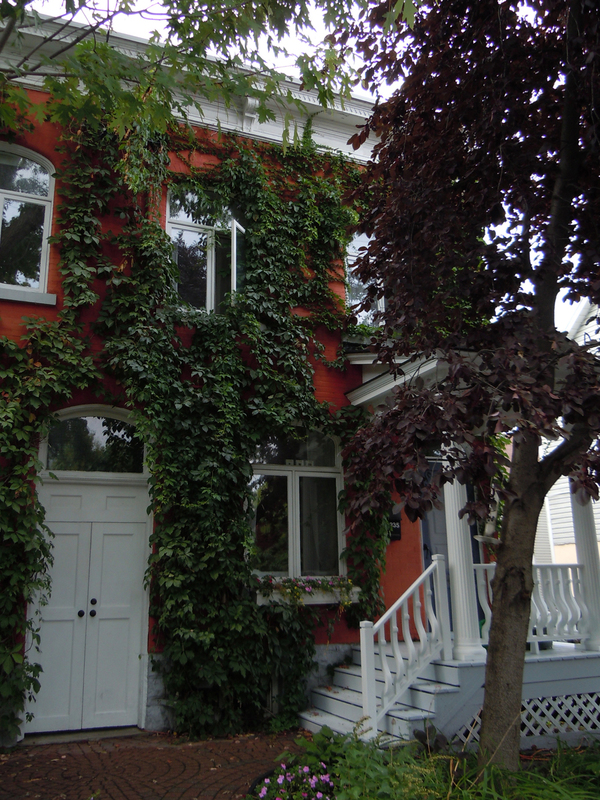 A particularly beautiful duplex in Lowertown / Byward Market. 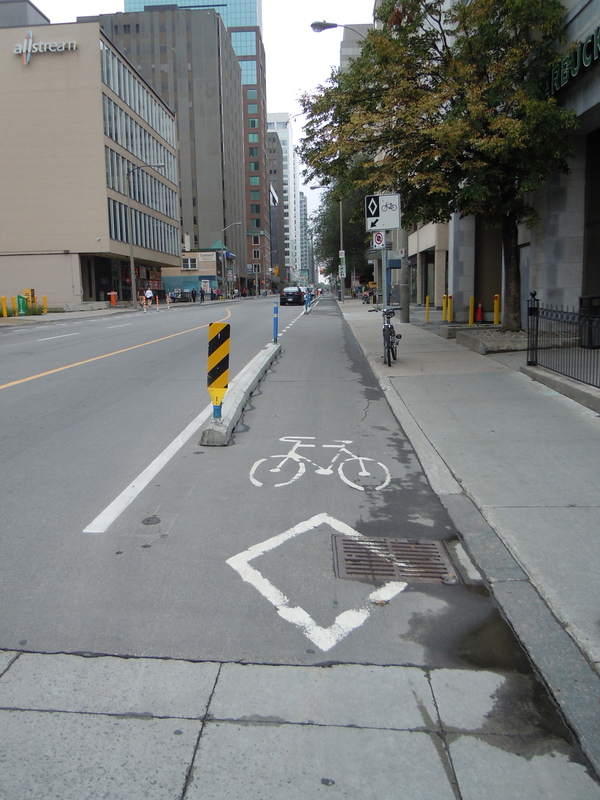 While Ottawa has the second highest percentage of residents who cycle to work in Canada –almost 3%– the cycling infrastructure is not quite up to Montreal standards. Fueled by the four universities, a network of serious curb-separated bike lanes, and popular bike rentals, Montreal has more of a cycling culture. 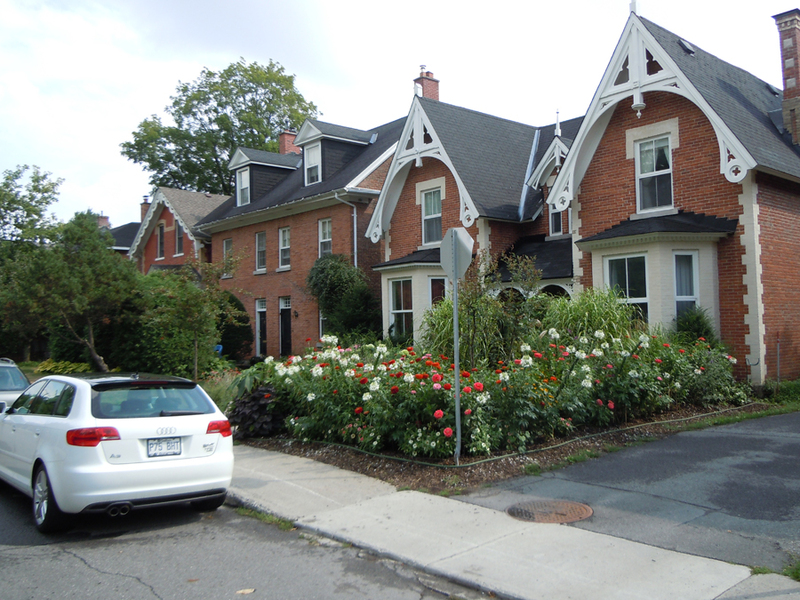 However, unlike in Montreal, I could actually locate a bike to rent in Ottawa, and had a great time touring neighbourhoods and riding along the canal. The one time I felt unsafe cycling was on my way back into downtown, where the series of “Share the Road” billboards didn’t seem to help matters. Cities contemplating solutions to similar challenges will find helpful Mike Lydon’s Bicycling SmartCode Module (4 mb PDF). Disconnects in the bike lane network along with details like drainage grates are the biggest challenges to current infrastructure. 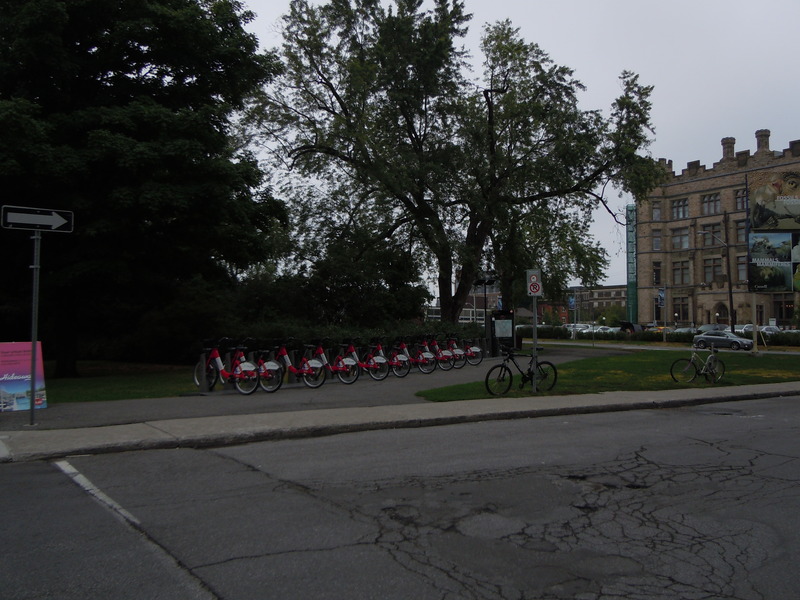 About 25 Bixi Bike rentals are throughout central Ottawa. 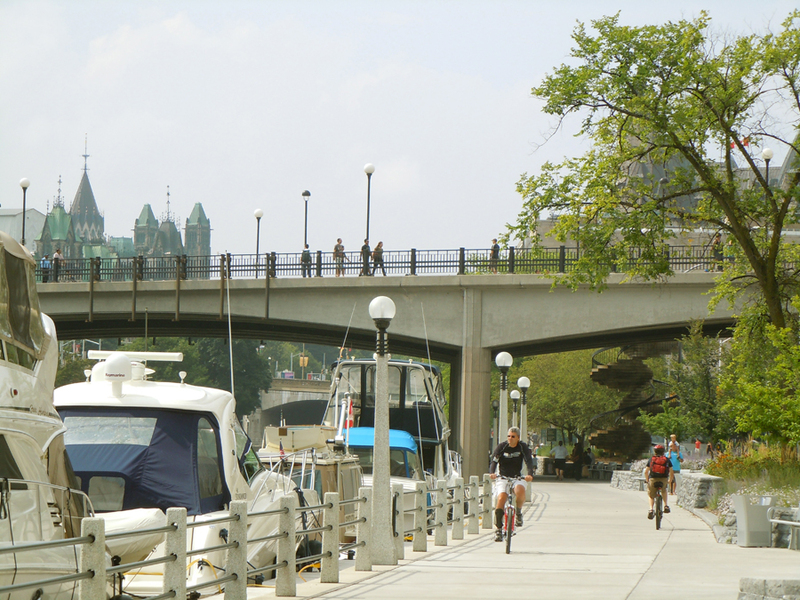 The Rideau Canal and neighbourhood streets are the best rides we found in Ottawa. 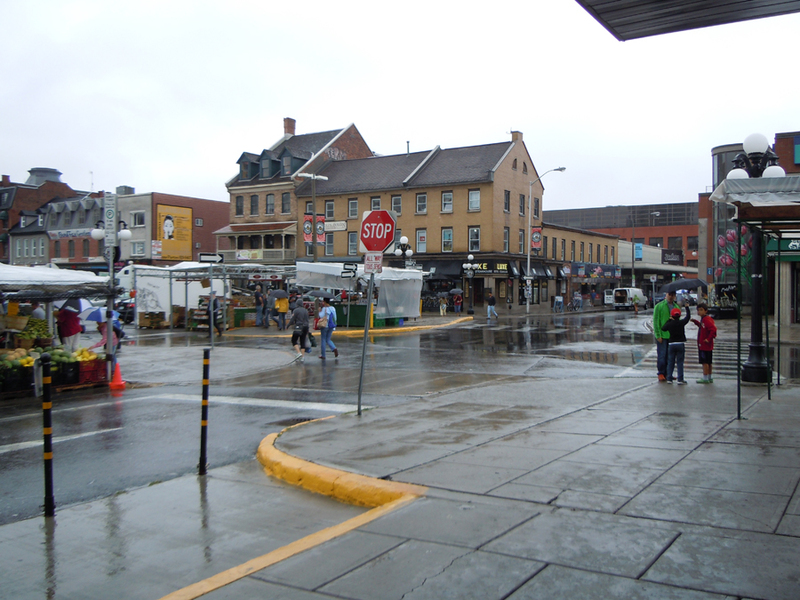 Byward Market streets welcome cyclists. Thanks for a lovely description of the city I call home. 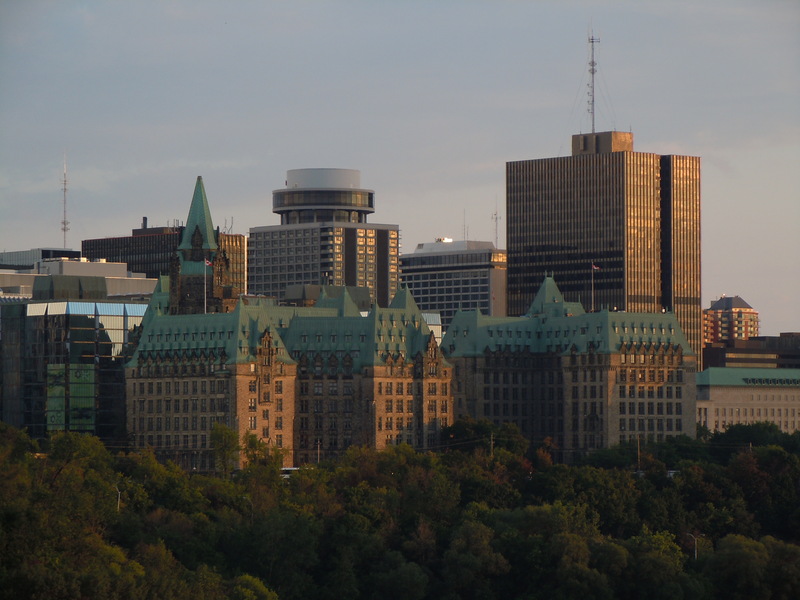 Ottawa is going through some growing pains. It is has been trying to implement a light-rail system to replace the existing Bus Rapid Transit corridor system, know as the Transitway, including the creation of a tunnel through downtown. This planning process has been going on for at least a decade, implementation has not yet started. 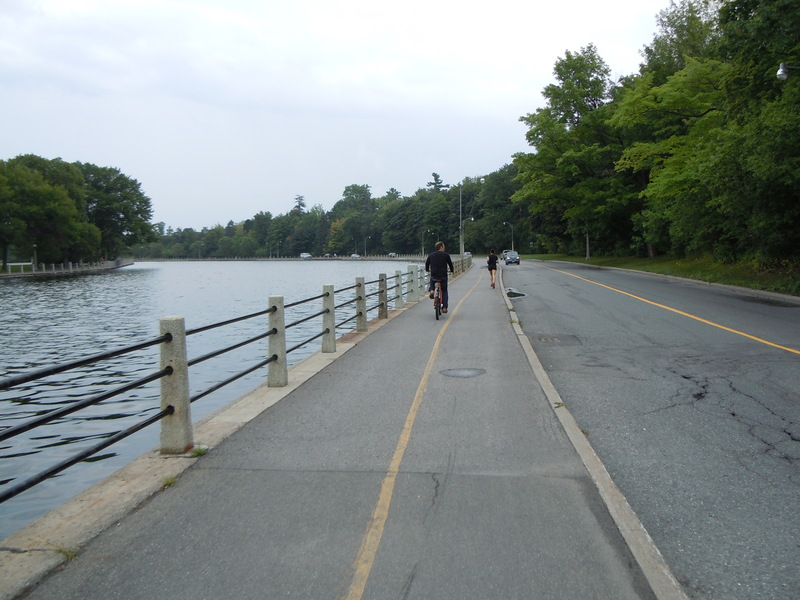 The bike pathways along the canal and the rivers are great and while these waterways have picturesque parkways on both sides, any significant park areas are separated from the neighbourhoods by fast moving vehicular traffic. It is rare to see families picnicking along the canal, as making ones way there with food, children and the family pet is not recommended. The one time a year that one sees a lot of families there is during Winterlude, a 3 week festival in February, where all types of fun activities take place on the frozen canal. Should you be in the area, I would be delighted to show off this lovely city. 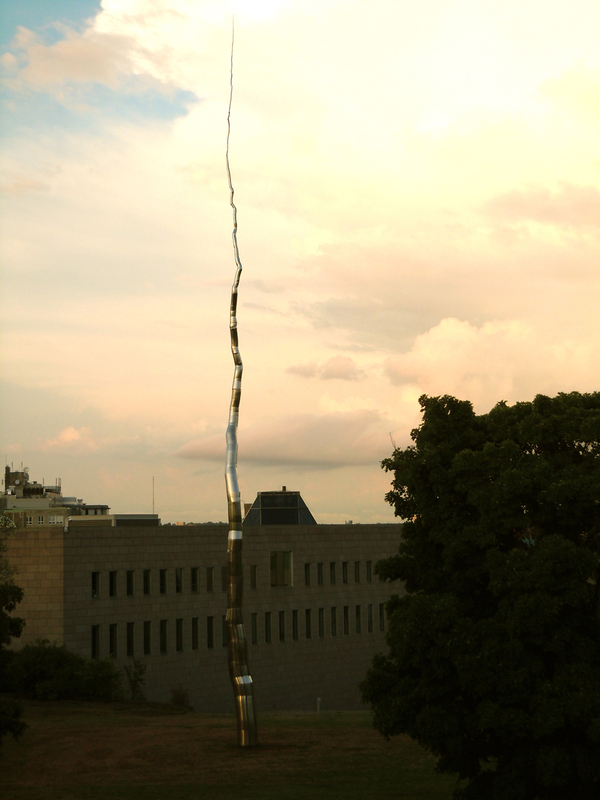 These photos seem to make the city look sparse on trees….especially street trees. I am not liking that. Nice article. You captured the city in a way I haven’t seen. While many complain about our city. You show us the things we should be proud of. Thanks for the comments, Tatiana, Robert, and Kevin. It’s an interesting process — looking for the good in a place. It’s something we call a synoptic survey — to measure the best performing urbanism that’s the most highly valued, and look for what policies and laws stand in the way of that development happening elsewhere. It is not like a SWOT analysis that inventories weaknesses and threats, which is also part of the planning process but is less fun to blog about. 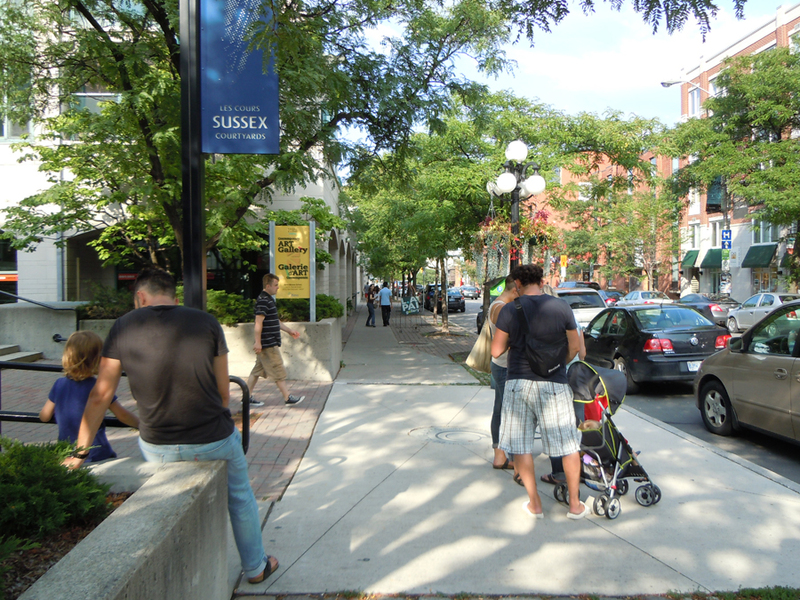 I live at Sussex and Rideau and get to enjoy the treats of living in the centre of the most sophisticated, cultured, geen and visually pleasing village in the world. As someone born in Ottawa I wish that I could claim this was planned , but alas,it wasn’t. This is accidental urban elegance at its best. 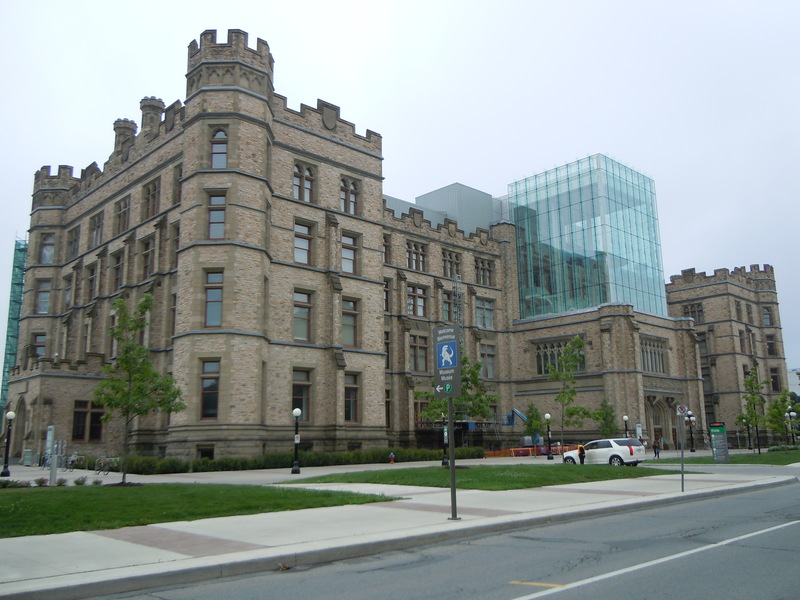 I visited Ottawa some years ago and have since wondered why no one mentions it as a good city. As for the fact that the city is not a result of planning, it seems like a plus to me. We need to find every instance where urbanism has worked. Ottawa seems like a great example.